It seems that TeeFury is onto our very special WedNESday celebration of gaming as well. Today's T-shirt is Miyamoto's Angels by Visual Singularities. Available for $10 at http://www.teefury.com/ for the next 24 hours. 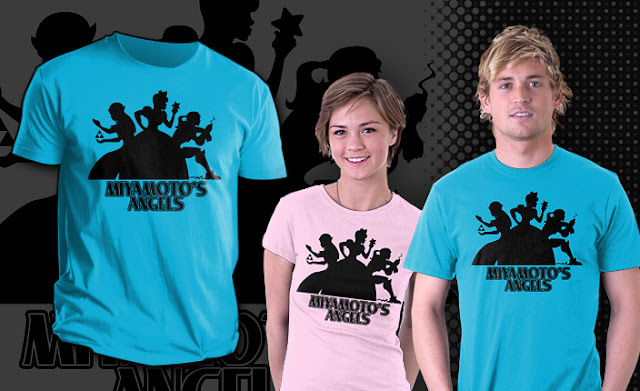 We featured TeeFury just recently with their grab bag of random t-shirts (I know that fellow contributor Taylor bought a few), and in that post we showed off one of the recent video game shirts (a mashup of Kill Bill and Super Mario characters)... but they've sold a bunch of awesome video game related shirts over the years. 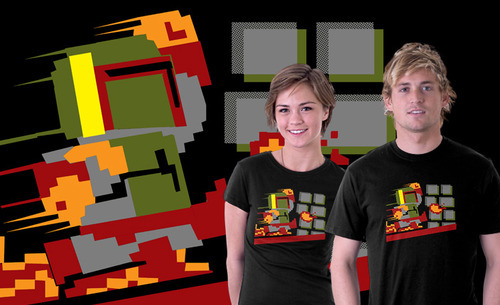 Here are my top 3 all time greatest TeeFury gaming shirts. 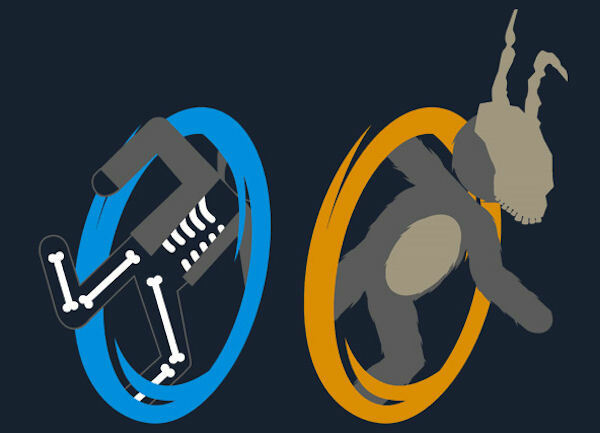 I think this was the perfect Portal mash-up (and there have been many). 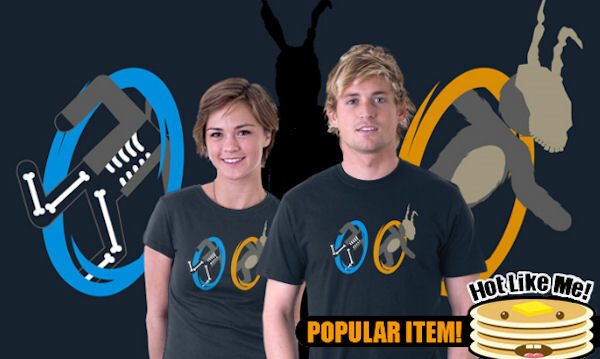 The tangent universe in Donnie Darko meets Portal's Aperture Science Handheld Portal Device. The two worlds from one nerdy movie meet up with the two pathways in a nerdy game… creating way too many holes to ever keep track of. There are so many mash-ups that kind of work, or don't work at all, but this one is just perfect. There's something about the pixel Mario design that just makes me smile. This is one of those mash-ups that really has no reason, but looks REALLY, REALLY cool. It makes me want to play an 8-Bit Boba Fett game. Maybe it's all underground levels and he's trying to fight his way out of the Sarlaac pit? Or maybe it's a young Boba Fett training to be the bounty hunter we all know and love. Either way, the shirt rules. This one takes the top spot for me. 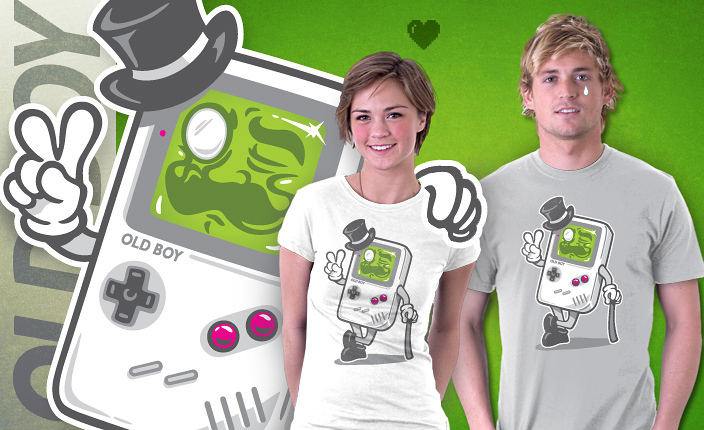 It's designed and laid out beautifully, and as a result, instantly ogled by all retro gamers. The original Gameboy design is so iconic, yet we rarely see it anymore. The cuteness made it into this design, as well as the chunkiness. TeeFury has a pretty vocal crowd of mash-up lovers vs. art lovers, and this one seems to fit right in the sweet spot in the middle.